When members of City Council pushed for an audit in 2016 to determine whether the Philadelphia Parking Authority was withholding money from city schools, PPA Board Chairman Joseph Ashdale was quick to voice his public opposition. But private conversations, caught on an FBI wiretap, suggest just how far he was willing to go to reward Council members who backed him — and punish those who didn’t. “I want [to] see who the f—’s going to” vote for it, he allegedly told Councilman Bobby Henon. “Because nobody [who does] is going to get a f—ing job out of here or a f—ing penny out of” the agency, the city’s lone Republican-held patronage mill. That threat — along with an alleged bribe that prosecutors say Ashdale paid Henon for his support — now forms the basis of one of the 19 corruption-related counts the councilman faces in the indictment filed last month against him, labor leader John J. “Johnny Doc” Dougherty, and six others. It also makes Ashdale the latest public official to be caught up in the investigation — a list that includes Pennsylvania Supreme Court Justice Kevin Dougherty and Henon’s colleague on Council Kenyatta Johnson, both of whom the Inquirer identified last week as unnamed officials described in the indictment. Like them, prosecutors have not named Ashdale in court filings. But four sources familiar with the investigation have identified him as the person referenced in the indictment as “PPA Official No. 2.” He allegedly bought Henon’s opposition to the 2016 Parking Authority audit with a gift of more than $3,000 in free windows installed at the home of the councilman’s chief-of-staff. Prosecutors describe that transaction as a bribe and have charged Henon with accepting the payoff. They declined to discuss why Ashdale is not being prosecuted. The Parking Authority chairman did not return calls, texts, and emails seeking comment. Henon’s lawyer, Brian J. McMonagle, rejected any suggestion that a quid pro quo had occurred. 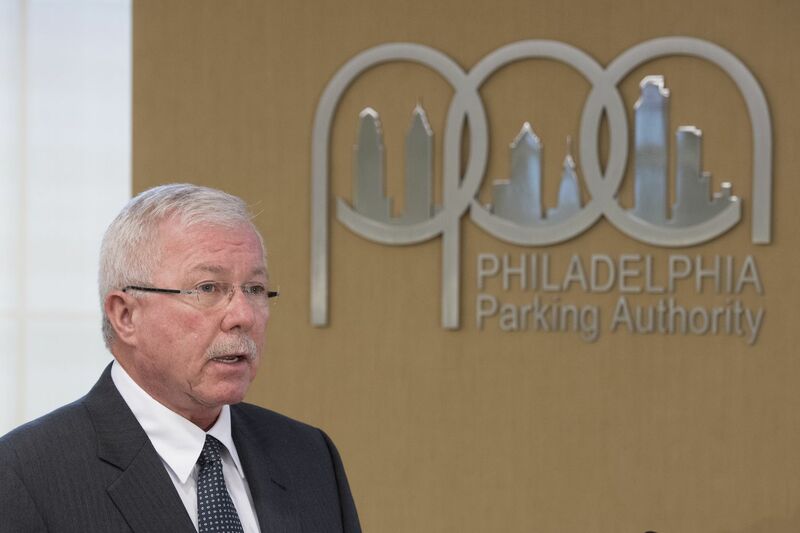 Ashdale, 62, has held the title of PPA board chair — a position that comes with a $75,000 annual salary — since it was created in the state’s takeover of the Parking Authority in 2001. He has steered the agency through scandals in recent years, including the ousting of its former executive director, Vincent J. Fenerty Jr., after two sexual harassment claims. Ashdale’s ties to Henon, Dougherty, and organized labor in the city run deep. He serves as leader of the Philadelphia-area council of the International Union of Painters and Allied Trades, which represents 4,500 painters, glaziers, drywall finishers, and glass workers. His union has given Henon — a Democrat and a member of Dougherty’s Local 98 of the International Brotherhood of Electrical Workers — more money than any other political candidate over the last 10 years, often maxing out each election cycle. Since 2011, when Henon was first elected to Council, he has received more than $100,000 from Ashdale’s union. In the last four years, the union’s PAC also has contributed thousands of dollars to one run by Local 98 and to candidates backed by Dougherty, including Mayor Jim Kenney and Justice Dougherty. So when Councilman David Oh — a longtime critic of the PPA’s leadership — called for the audit of the parking authority’s books in 2016, Ashdale turned to Henon for help. Oh, along with Councilwoman Helen Gym, introduced the resolution June 9, requesting the review of the PPA’s policies and procedures after a 50-cent-per-hour parking rate hike failed to produce promised revenue increases. The PPA, under state law, is required to devote a portion of its revenues to supporting Philadelphia schools. In an interview last week, Oh said he felt frustrated that the Parking Authority always seemed to be falling short of expectations. “It seemed like they were not just broke, but desperately broke,” he said. Two days after Oh introduced his measure, Henon called Ashdale and pledged his help to defeat it. It was on that same phone call, prosecutors say, that the councilman first asked the PPA board chair for assistance in obtaining glass windows for the house in Northeast Philadelphia of a woman the indictment describes as a “close friend” of Henon’s. Sources familiar with the investigation identified her as Courtney Voss, Henon’s chief of staff. She declined to comment when contacted by a reporter. As Henon and Ashdale continued to discuss the audit resolution over the next several weeks, their discussion frequently was peppered with references to Ashdale’s progress in having Voss’ windows installed, according to the indictment. “We’re gonna pay for the material, and she’ll just pay for the labor,” Ashdale told the councilman in a June 2016 conversation caught on an FBI wiretap. A supplier delivered 27 panes of window glass to Voss’ house in August of that year. Almost a month later, Council voted to reject Oh’s proposal. Recalling that vote last week, Oh said the opposition to his resolution emerged after an intense lobbying campaign by Fenerty. But something finally clicked for the councilman when he read prosecutors’ account last month of the backroom dealings between Henon and Ashdale. “I knew [the failure of the resolution] was orchestrated,” he said, although until then he didn’t know how. Henon’s lawyer scoffed at the idea that his client needed a bribe to defeat Oh’s measure. McMonagle pointed out that the bill was tabled for months soon after it was introduced and then eventually voted down by a majority of Council. What’s more, the attorney maintained, the fact that Ashdale and Henon discussed Voss’ windows and the Council vote on the same phone calls was entirely coincidental. Most of Ashdale’s PPA colleagues remain reluctant to say whether the indictment’s allegations should disqualify him from leading the agency’s board. Gov. Tom Wolf — who holds the power to appoint and remove the PPA board chair — said anyone charged in the investigation should step down. He declined, through a spokesperson, to specifically comment on whether he believed Ashdale should be in that camp. But amid the silence, one official was willing to speak out: Al Taubenberger, the lone member of Council to hold a seat on the PPA’s board. Despite the allegations laid out in the indictment, he said Ashdale has his full support.